Everyone wants a beautiful lawn, and that involves a certain amount of care and work. You have to mow on a regular basis, trim hedges, weed, fertilize, and water the yard. Most of this becomes a routine, and essentially, you spend the most time on it during spring and summer, when the growth runs rampant. 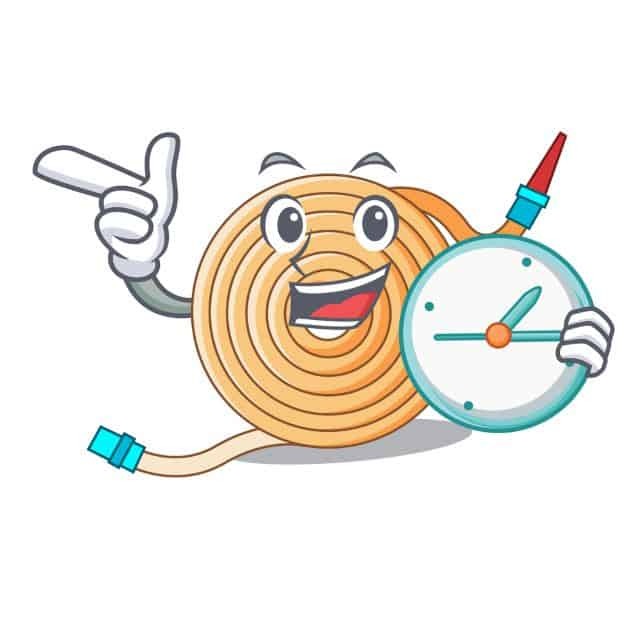 When it comes to watering, you may use soaker hoses, though this can be quite a time to consume and require a great deal of excess attention. More likely, you’ve had a sprinkler system installed. What you may not know is that sprinklers have to be used with care as well. In fact, it’s important that you determine the best time to run sprinklers in your climate and for your particular grass. How Do I Know My Lawn is Getting Enough Water? How Long Will I Need to Water? Do I Need to Water My Yard in the Winter? Are All Sprinkler Systems the Same? What is the Best Time to Water? This is not something that is set in stone. While there are recommendations, there are plenty of factors that could cause you to need to adjust those ‘ideals’ to fit your situation. To determine how much water, you’ll need to provide for your lawn, you should investigate the type of grass you have, since the answer isn’t the same across the board. Also, you’ll want to consider your climate. A humid, cool climate might not require quite as much water like a desert area with heat waves. However, a good, general rule of thumb is that you should give your yard an inch to 1 ½ inch of water per week. It’s hard to gauge how much water your lawn is getting without some sort of measuring device. 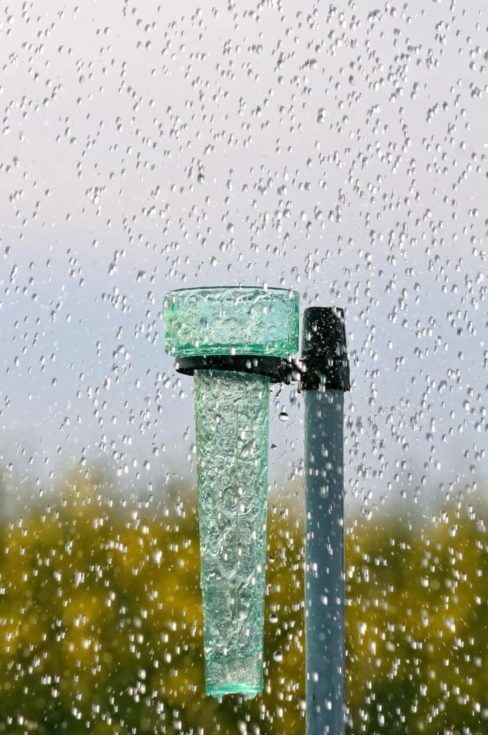 Try installing a rain gauge, somewhere that will show the accumulation of precipitation as well as the water from your sprinkler system. If you’re getting the recommended amount of water from the natural elements, you won’t even have to concern yourself with watering the lawn. However, if you are short of an inch (or the recommended level for your climate), you’ll need to supplement through the week with your sprinkler system and assure you reach that level. Note that the level of greenery and overall health of your lawn will also help you determine if you’re giving it everything it needs in terms of moisture. Another great way to tell if there’s enough moisture in your yard is to take a 6-inch screwdriver and dig it into the dirt. If it doesn’t slide in with relative ease, the ground is too dry, and you need to water more. This, again, is climate dependent and could also be affected by the type of grass you have, especially with specialty grasses you may be growing or newly planted turf. In the drier seasons, you’ll need to spend more time watering, especially when it’s hot and you’ll lose some of the water due to evaporation. 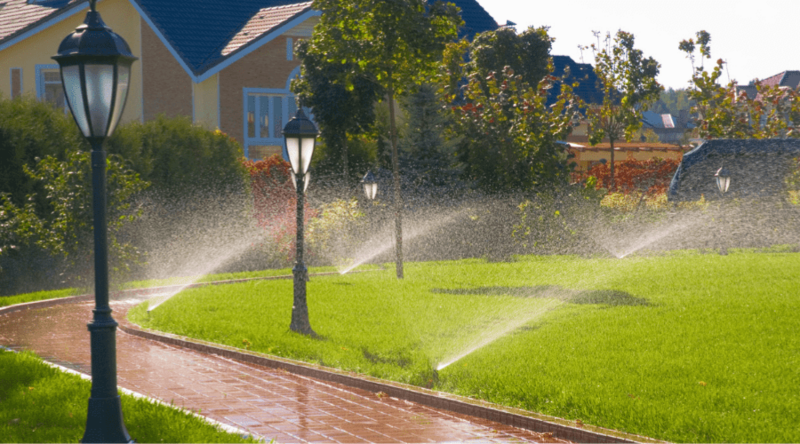 You want to continue watering until the entire yard is saturated, and it may take time to learn how long this takes, especially if you’ve got a new sprinkler system, have just re-planted new grass, or are new to the house. To try to simplify, a good rule of thumb is that you should stop watering just before there is a runoff. Water running into the street means that the yard is saturated and can’t hold any additional moisture, and it’s also not cost-effective, wasting water. For most yards, as a general rule, 20 to 30 minutes maximum is enough to get the desired results. However, this isn’t always the case. In drier, hotter months, you may need to water a little longer, while in the cooler season or when you’re getting a lot of rain, you may not need to water for nearly as long. Gauge what is required based on climate, weather, and circumstances. One sign to look for that you are overwatering is the appearance of mushrooms. Since these are a fungus, the growth can be a red flag of other fungus and mold that may be lurking in the yard, which is all harmful to the growth and health of your grass. If you start to see mushrooms, you need to cut back on watering and let the yard dry out until the mushrooms disappear, leading to any other disastrous fungus and such going away as well. Ideally, if you are saturating your lawn when you run your sprinkler system, you should be watering 2 to 3 times a week. This should give you just the right amount of moisture (reaching that 1-inch mark, or whatever is best for your lawn in your climate). Watering daily doesn’t result in the same healthy lawn. It causes your grass to grow shallow roots, which tend to dry out faster and weaken the turf. If you water 2-3 times a week, your root system will be deeper and more resistant to drought. Of course, there are factors that might cause issues with your ability to do so. For example, during droughts, there are often limitations to how often or when you can run your sprinklers, sometimes only allowing a half hour once a week. In such circumstances, invest in soaker hoses to supplement. You’ll find that there are less strict restrictions on the use of soaker hoses because they don’t end up with the same loss through evaporation that sprinklers do, and this can significantly assist in keeping your lawn healthier. One thing to keep in mind is that you may need to water more, as well as more often, in summer months, when the heat becomes excessive. Your yard will be more susceptible to stress due to heat and drought, so it’s essential you keep that water flowing as needed. For best results, you can start by not mowing so heavily. In fact, raise your mowing height, since longer grass will help keep the heat and sun from getting to the bottom of things, so to speak, and burning the grass too close to the roots. In addition, you can give a cursory watering (about 5 minutes) in the morning or even midday, every day, that will help cool off your lawn and keep your grass from burning too quickly. If you don’t want to set a schedule because you get a good amount of rain in your area, there are other ways to tell when you’ll need to water. For example, if your grass is a dull green or even has a grayish tint to it, you should water the lawn. In addition, when walking across your lawn, take a look at your footprints. They should recover quickly, the grass standing up within a few seconds. If that doesn’t happen, it means the blades aren’t holding enough moisture to have the spring that brings them back, and you should turn on the sprinklers at the earliest convenient time. While it may seem like a waste to water the lawn in the winter, since grass is typically dormant, and your yard looks bare, this isn’t the case. The grass still has its deep-seated roots, and it’s essential to assure they remain moist and healthy so they allow for optimum growth in the spring and summer. Depending on your climate, snow melting into the turf may allow enough moisture to reach those roots. On the other hand, it may be a hindrance, if the snow is staying for long periods of time, keeping you from being able to water and allowing the ground beneath the powder to dry and crack. You should water your lawn in the winter, whenever possible, taking care to use your sprinklers at times when the temperature is highest, so the water doesn’t freeze so readily. Look for local sources of recommendations on how to deal with snow and ice or other issues that present themselves in the winter and cause frustration with maintaining your watering routine. The answer is, definitely not. You can’t make a blanket statement about what to expect in terms of speed in saturating your lawn because every sprinkler system is different, and the climate in which it’s used also causes variances in output. For example, the same sprinkler system may produce faster results in Michigan than in Texas because it’s not so warm, and less water will be lost due to evaporation. In addition, the sprinkler systems two neighbors have may have a completely different output. Or, the same system may be more efficient in April than in July due to the change of seasons. There are plenty of factors involved in what you can expect from a sprinkler system, and it’s vital to do your research rather than trying to liken yours to someone else’s as a reference. 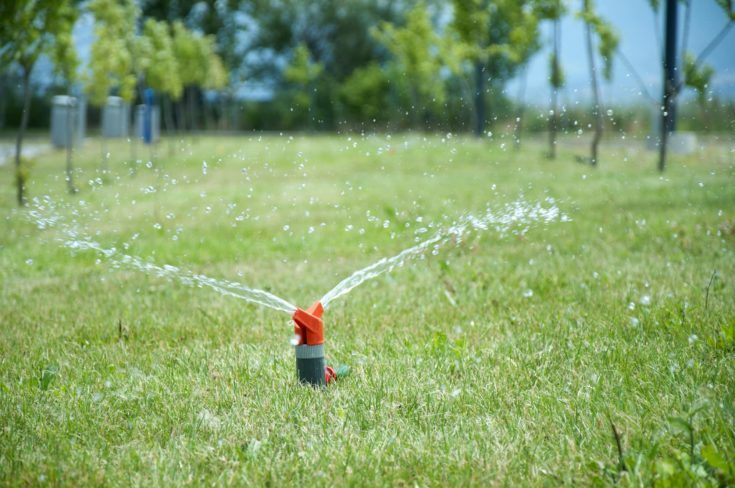 If you don’t have an in-ground irrigation system and want the best performing sprinklers installed in your lawn, you should consider purchasing pulsating sprinklers rather than oscillating ones. With the pulsating action, you get a horizontal spray with higher velocity, which leads to less vulnerability to elements like wind and heat causing evaporation. By comparison, oscillating sprinklers spray straight up in the air, which just leads to greater loss and inefficiency. It’s so easy to ‘set it and forget it’ with automated sprinkler systems. Most of us take for granted the easy operation of the system based on the controls we set. However, in order to make sure you’re actually hitting the right spots at the right volume, you should check the sprinkler system at least once a month. You may find that sprinkler heads have ceased to function, are pointed in the wrong direction, don’t shut off on schedule, or don’t reach their entire designated area. You should look to correct the situation if you find that one of your heads is actually pointed out toward the street rather than over your lawn. This is easy enough to fix, but only if you identify the problem. In addition, you might find that, while the rest of the sprinklers are shutting off based on your input due to significant rainfall or severe, freezing cold, but one particular head remains running, perhaps even causing a slick spot of frozen water that is a danger to drivers. Keeping your sprinkler system in working order is crucial to retaining a healthy lawn, as well as avoiding situations that could even cause dangerous circumstances. The best time to run sprinklers won’t matter if you don’t have all the other elements settled into place. If you’ve checked your sprinklers to assure you have full coverage of your yard, inclusive of the area in question, you may need to consider that it’s not related to dry roots or watering efforts. Instead, think about additional possibilities that keep the area from gaining a healthy green hue. For example, that brown and dying area could mean another underlying issue, such as fungus. You may need to purchase something to treat the grass for disease, so be sure you know what kind of grass you have and the possible diseases you’re looking for. This can help you narrow down which treatment option will remove the problem, so you can get back to relaxing. In most cases, you want to water early in the morning, either just before or just after sunrise. There are several reasons this is the ideal time to set your sprinklers to run. Waste not, want not – The early morning hours tend to be cooler and have fewer winds than later in the afternoon. Because of this, you can expect less evaporation of the water spraying in the air, leading to less waste and greater coverage, faster, rather than having to run the system longer, which increases water bills and could be a problem, especially during droughts, with the city water provider. 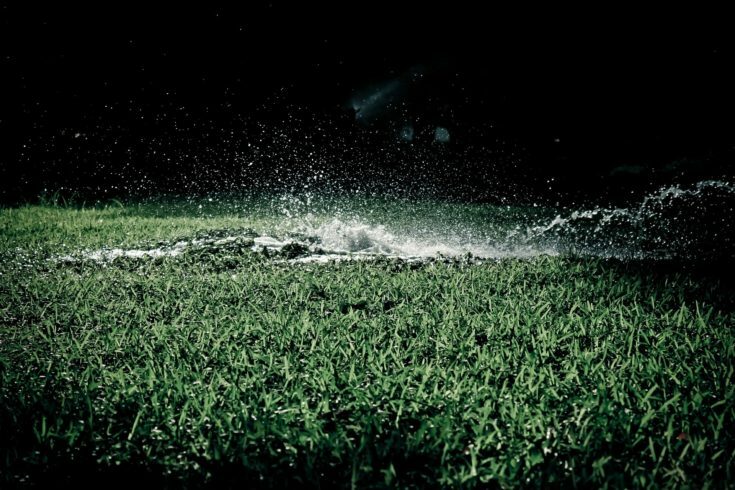 Time to dry – A wet lawn overnight can be detrimental to the health of your grass. You can end up with horrible fungus or other diseases due to the constant wetness of the yard, which negates the advice some give to water during the night. However, watering in the early morning, even just before dawn, assures that the lawn has time to dry, even when it’s cool and cloudy, before nightfall. Of course, no rule is written in stone, and there are some exceptions to keep in mind. Cooler climate – If you live in an extremely cool environment, you may want to consider the merit of waiting to water until later in the day, when sun and heat are at their peak. This will help assure that the lawn is saturated but also better able to dry without concern for freezing water that won’t soak into the ground. 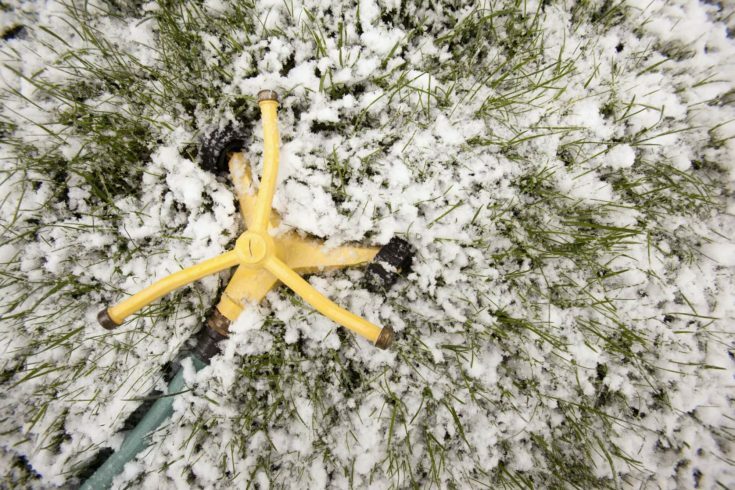 Winter Months – Similarly, because temperatures may be below freezing, you want to make sure you are watering at the time in which the yard is most likely to receive the moisture and that there is still time for it to dry prior to temperatures dropping and causing the water in the ground to freeze. Know more about your yard and the expectations you should have based on the type of grass you use and the climate where you’re growing it. Watering correctly can make or break the health of your lawn. Consider first that no two lawns are the same, and don’t always rely on the general rules, especially if you have specialized grass or live in a particularly difficult environment. You should always research the specifics of your area as well as the type of grass you’re growing for best practices. However, you can start with the general ideas and grow from there. Be sure you’re not watering every day (except for the minimal few minutes to cool off your long during the warmest months), instead of watering deeply 2 to 3 times a week to support a strong, deep root system. Don’t water overnight because you want to avoid causing a greater risk of fungus and other diseases overtaking your lawn. In fact, opt for early morning hours in most cases, assuring the least amount of loss due to wind and evaporation, as well as knowing that your lawn will dry prior to nightfall. Stop watering before there is a runoff for best practices and to avoid waste. 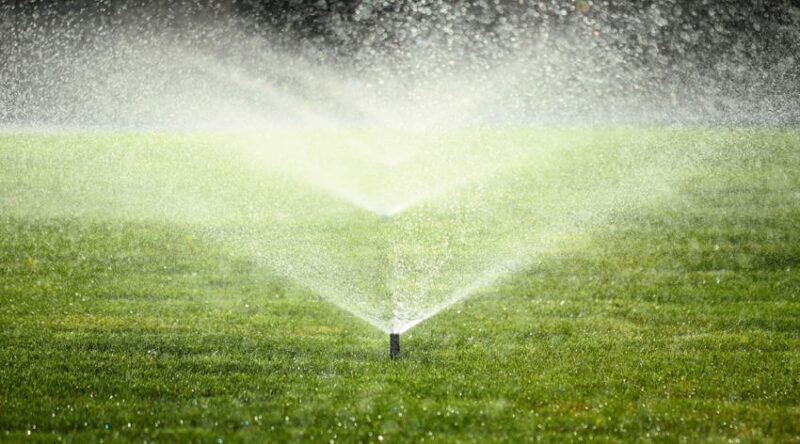 Also, check your sprinkler system from time to time to assure all your sprinkler heads are working properly and that the timer system is in good, working order and translating to your actual watering practices. Finally, if you’re utilizing above ground sprinklers rather than an installed system, make sure you choose pulsating sprinklers rather than oscillating ones. This will help reduce waste from wind and evaporation, so you have better results and useless in the process. And if you have a ban on sprinklers during a drought, keep soaker hoses as a backup so you don’t end up with a dead and dry lawn.